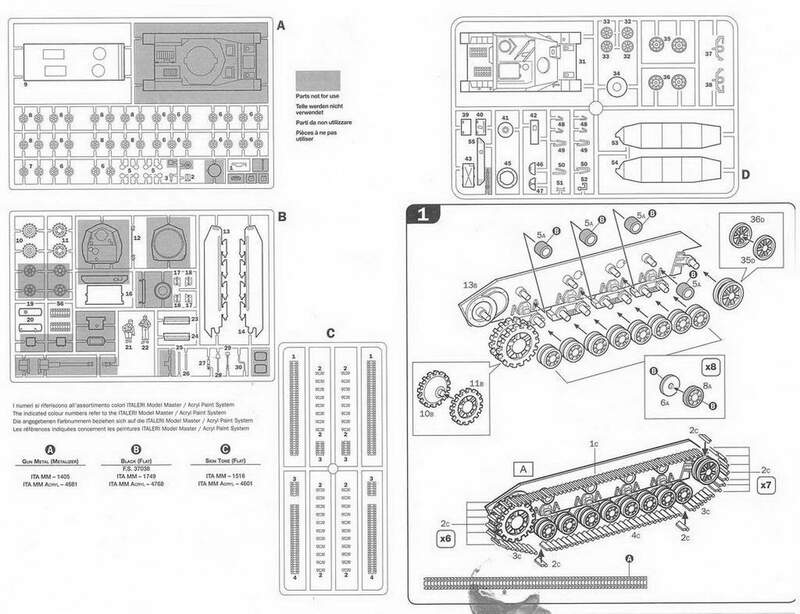 The kit consists of 169 pieces cast in medium brown plastic, a small sheet of decals, and a set of black and white instructions, with information and directions in the major European languages, including English. Rear of the box has colour panels depicting for three differing paint scheme options. This kit is the re-released Esci model from around 30 years ago. Despite its age, the casting is excellent, with crisp detail, and almost no flash, on the pieces. 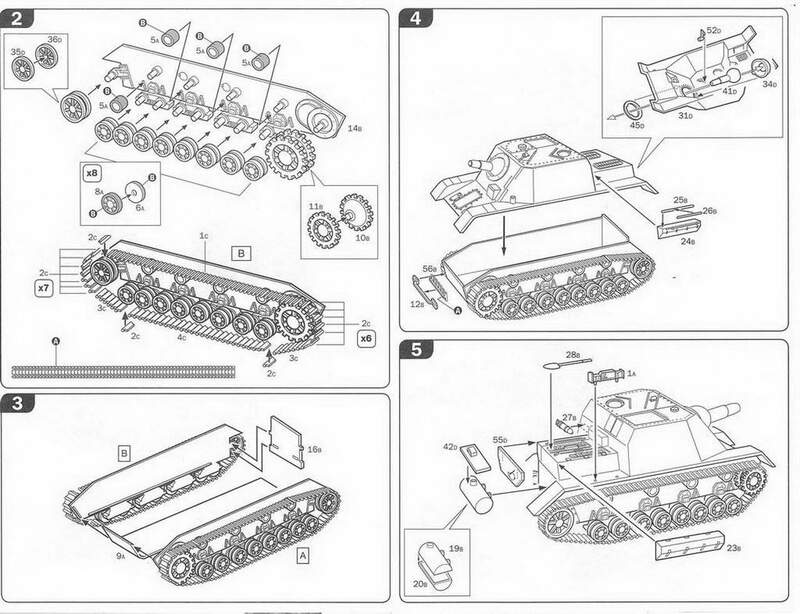 Twenty six pieces provided are surplus to requirements, these being a Pz. IV upper hull, & pieces for a complete Pz. IV turret with long 75mm cannon, useful additions to the spares box. Two crew members are also supplied. The lower hull, wheels and track assembly are very straightforward to assemble. The front drive sprocket has a small external hole in the centre, this is easy to fix - it just needs a small amount of filler. I found the drive teeth on the front sprocket to be a bit too large to mesh with the guide holes in the track, so sanded them back, rather than try to thin them. A little care is needed fitting the tracks around the front and rear sprockets, as the track pieces in these areas are individual links, and care is needed to place them perpendicular to each other and at the correct angle. I cut and trimmed all the pieces for the tracks in advance, and affixed each side in one sitting, in case any adjustment needed, should there be a need to lift and re-affix any pieces (before the liquid cement has completely set). The upper hull assembly is even easier to complete, the large box like superstructure being moulded in one piece. 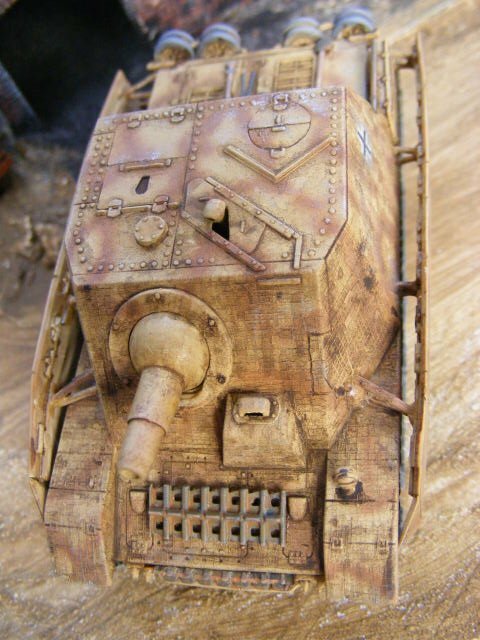 At this stage, the modeller needs to decide how far they want to go with this model. 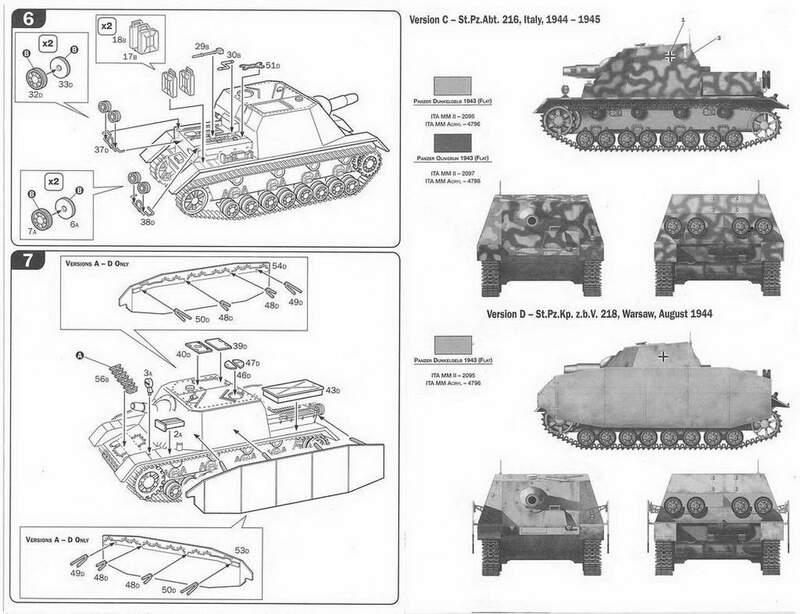 This kit is a mid production Brummbar, and the photographic evidence suggests that these had factory applied Zimmerit (anti magnetic mine paste) applied at the factory in Vienna. 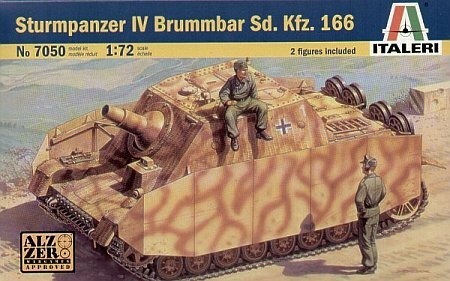 The box art shows the model with an even coat of factory Zimmerit - but the kit inside the box comes moulded with a smooth plain steel superstructure. Some modellers would consider it a must to apply Zimmerit to this version of the Brummbar, given the photographic evidence, but really, it's up to the individual modeller. And in real life, exceptions to the conventional wisdoms do occur. It's outside of the scope of this review to cover Zimmerit application options, but they include do it yourself options, as well as buying after market ready to apply sections. I'm strictly an out of the box builder, who occasionally tweaks kits a little, and this is what I did with this one. 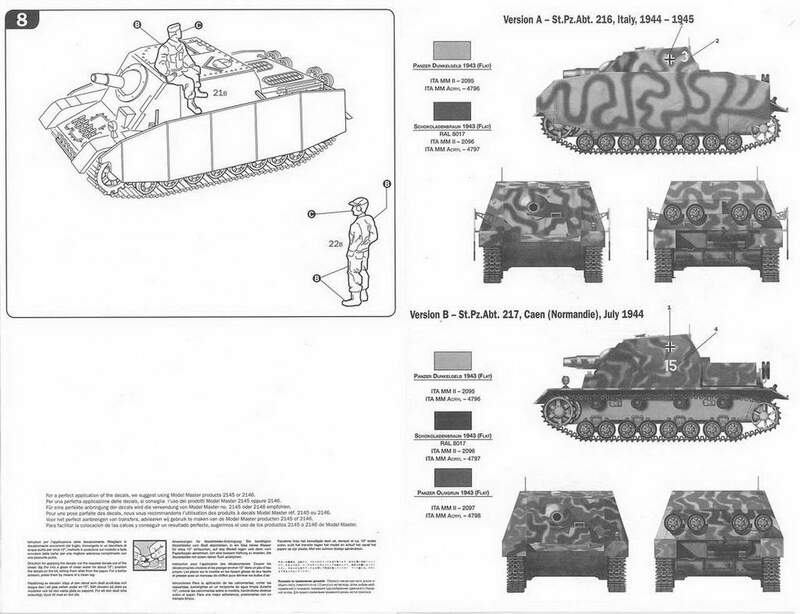 Not wanting to order and wait for aftermarket products, I used the simple option of scribing the surface of the tank, with a new sharp modelling blade, to create horizontal and vertical lines, to simulate Zimmerit. This requires a good eye (and magnifier) and steady hand, and a small metal ruler or similar to scribe a straight line along. The result achieved here looks more like a 'field' application, rather than a 'factory' application, but was fairly easy, requiring no financial, outlay, just an investment in patience and concentration, and has improved the look of the vehicle. Other small fixes to consider are filling the back of the side mounted tool box, as it's moulded 'hollow' and part of this can be seen over the top of the back engine deck. Also the box art shows two pistol ports on the superstructure, which don't come in the kit. Reference pictures confirm this mid production model should have two pistol ports each side, but I didn't discover this till the model was complete. If you are not going to add the schurzen you may also want to improve or replace the return rollers which are each cast as one piece. They are not really noticeable if you choose to leave them as is, and can't be seen at all if you add the schurzen. The crew hatches on top can be moulded open, all other hatches and doors are moulded shut. 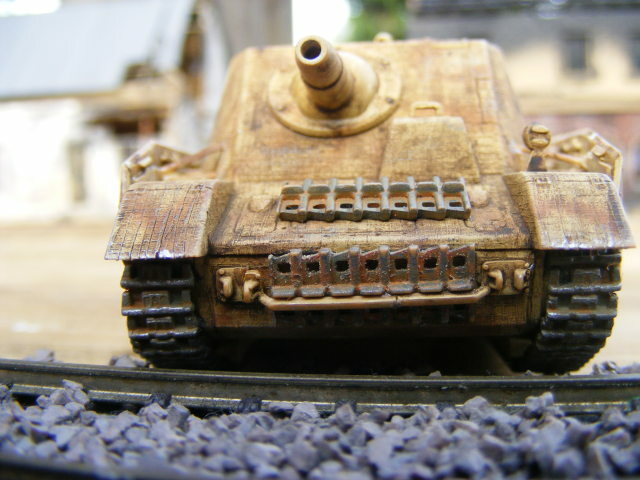 The hull schurzen are perhaps the hardest pieces to fit. The instructions are very clear in all aspects of assembly excepting exactly where the brackets fit to the body. You need to carefully study the last two diagrams in the instructions to get this right. Even better if you have some good reference material, to remove all doubt as to their placement. I assembled and attached these last, after all painting and detailing was completed. Before painting I used a knife to scribe some random scratches, particularly on the lower surfaces, of the schurzen. The schurzen are cast as one piece for each side, which would require some scratch building of the skirt hanging frame if you want to remove a sheet or two for a more interesting or battle worn look. 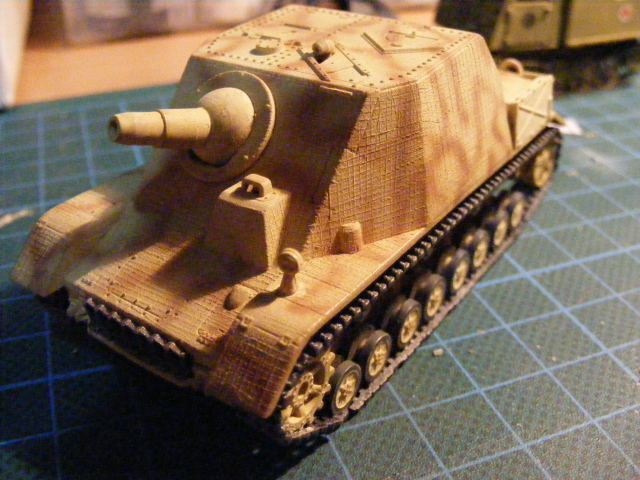 I left the assembled model to harden for 1 - 2 weeks, then painted it with several thin base coats of Humbrol 83, (lightened up with white), which toned down my scribed Zimmerit. 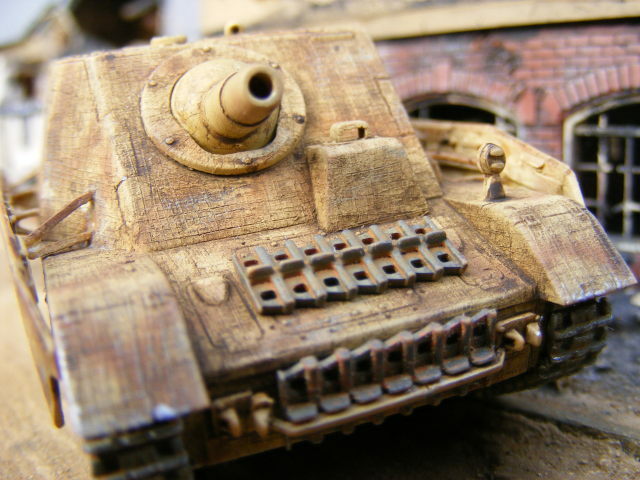 I then applied the red brown stripes with Humbrol Matt 62, also very thinned. The colours and pattern used is similar to the art on the front of the kit box. (And this pattern is similar in style to several pictures of Brummbars in Italy in 1943-44). I then reapplied a thin spray of the base coat over the whole model again to lessen the contrast between base coat and stripes. After it had thoroughly dried (about a week), I applied an overall wash of turps with a little Winton Burnt Umber oil paint to raise some of the detail. I applied a Balkan cross to each side with micro set, which don't fit as flat on the irregular surface as they should. 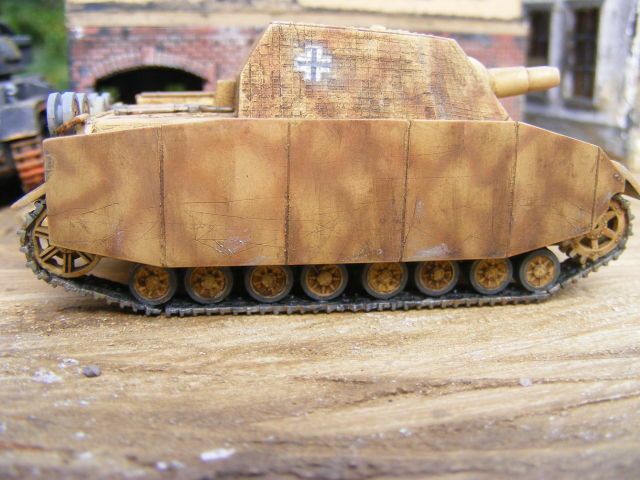 The figures supplied were the common Esci panzer crewmen which were added to the spares box. This model is a straight forward build, the only slightly challenging aspect being the fitting of the schurzen (and adding of Zimmerit should you choose to). Overall quite an enjoyable build, and except for the points mentioned, the pundits' view is that this is kit is quite an accurate representation of a mid production Brummbar.